Think back. Did you know how you were going to meet that special person who added so much to your life? Did you specifically know how or when you were going to get the job or the house that you have right now? Chances are you didn’t. Oh sure, there were lots, even years, of action – but the final meeting up was quite “co-incidental”. Like playing a game of chess, or any game, you rarely know the full consequences of any particular move that you make right now. So, don’t “take score” TOO SOON!! 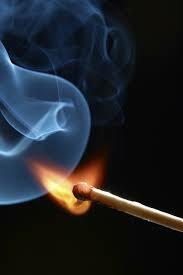 A Match in a matchbox, has an Intention to create a flame. It doesn’t know Where or What surface it will be struck upon to light it. It doesn’t understand about the Oxygen needed for it. It can’t control when or where the fingers will be that are needed for the striking of it. It can only offer its Intent. When conditions are right, a flame will be created. We can only focus on our Intent. When the time is right, our Oxygen, , and Fingers for striking will show up. We can not predict or force any of those. Just as we didn’t know how we would end up meeting our pets or mates, or getting (or losing) that last job. Conditions will manifest, when the time is right. Timing – AH, the nasty little bugger in the issue. Whose timing? I WANT IT NOW! If the Universe were to TRY to keep up with what YOU THOUGHT was the “RIGHT” timing, it would throw complete chaos into a perfectly running system. We think we REALLY want something – BUT give us 20 minutes, or a day, or a month, and we’ve already changed our perspective, or altogether moved on to something else. The Universe only does what We should do – focus on IT’S Intent. IT’s been here a lot longer than any of us. It holds Galaxies together! It made sure YOU were the winning sperm and egg out of millions, didn’t it!! IT knows when conditions are best for ALL parties involved! So don’t take score too soon. Be Persistent, Patient and Positive! OWN your Intention. There are many fingers and striking surfaces that you are not even aware of, that will come into play. Just as they have in the past. And remember, YOU also are a Finger. You also, are someone’s Oxygen that they don’t even know about yet! You are a gift, an answer, to their Intentions as well. You have that in YOU! Go light a fire! This entry was posted in Daily Blogs and tagged Appreciation, Buddhism, daily inspiration, Happiness, How to be happy, Inspiration, Intention, jobs, Law of Attraction, Life, philosophy, Positivity, Science, Spirit by MomentumMikey. Bookmark the permalink. I am amazed at your ability to light a fire, Mikey! Thank you, and blessings and peace to you as well. What an EXCELLENT article! Thank you so much for posting. I loved your analogy about the match, and how it’s so important for us to hold our intention. Thanks again! Great work. You’re very welcome. “Your” inspiring content came at just the right time. I mean it. You reminded me of why I’m continuing with my blog…sharing positive messages that I hope will help people continue to reach for their dreams. Thank you SO much! You are such a smart writer. Thank you and blessing with your new job.